Reference 3-way Center speaker from the SVS Ultra Range delivering pristine dialogue clarity for uncanny realism, outstanding dispersion and accuracy throughout a room. SVS Ultra Centre reference-standard 3-way speaker delivers the front stage of a home AV system with incredible dynamics, huge soundstage and pure clarity for uncanny realism and dialogue intelligibility regardless of where you are in the room. SVS Ultra Center speaker features a meticulously tuned SoundMatch three-way crossover with dual 6.5" glass fiber composite woofers, vertically aligned 1" aluminum dome tweeter and 4" midrange driver. From the acoustically augmented cabinet geometry to the premium components and build standard, the Ultra Center is a star among home cinema speakers. This three-way crossover design is imperative for a truly stand-out center channel. A center channel speaker is often the most underrated in a home surround sound system as it handles the majority of dialogue, vocals and music that’s coming from right in front of you in a movie. 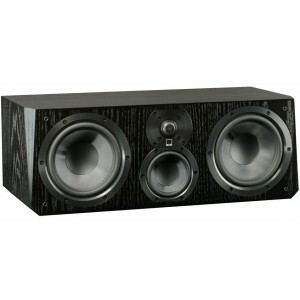 SVS speakers, unlike many rivals, do not compromise with a two-way design or thin center speaker with flimsy drivers. SVS Ultra Center is optimised for horizontal placement raising the most challenging movie and music content to reference quality. For the vital midrange, the SVS Ultra Center speaker features a sturdy 4" composite glass-fiber cone midrange driver with incredible stiffness to mass ratio for high sensitivity and retaining pistonic behavior well past the band of the driver. The midrange is housed in its own sub-enclosure and vertically aligned with the 1" aluminum dome tweeter which employs an FEA-optimised diffuser to ensure broad dispersion for a wide and convincing soundstage and perfect on/off-axis frequency response. This means the largest “Sweet Spot” so everyone can experience the same stunning clarity. Dual 6.5" woofers deliver rare and effortless bass output and power handling capabilities. All components in the Ultra Center channel speaker act in harmony to provide crisp vocal clarity, unerring dialogue intelligibility and powerful dynamics while anchoring the front stage with flawless transitional effects and a huge soundstage. Whether conveying the airy dialogue of an intense conversation or the multi-layered, high-impact soundtrack of an action movie, the Ultra Surround speaker delivers a powerful and convincing audio experience. Each feature on the Ultra Centre channel speaker’s cabinet is designed for a specific sonic purpose. Tapered edges on the cabinet’s front baffle minimise edge diffraction for clear and precise soundstaging. Internally, each cabinet employs separate sealed enclosures for both mid-bass drivers and tweeters to optimize performance and minimize interaction. Even the grille design is FEA-optimised to increase acoustic transparency.